Accent Plus Metal Door Stopper, Cat Door Stoppers Decorative, Bronze Colored Cast Iron by Accent Plus at Home Decor Outlet Store. MPN: B1-BFEC-E616. Hurry! Limited time offer. Offer valid only while supplies last. The wedge design of this iron door stopper is compatible with almost any door! it is an adaptible door slam stopper! 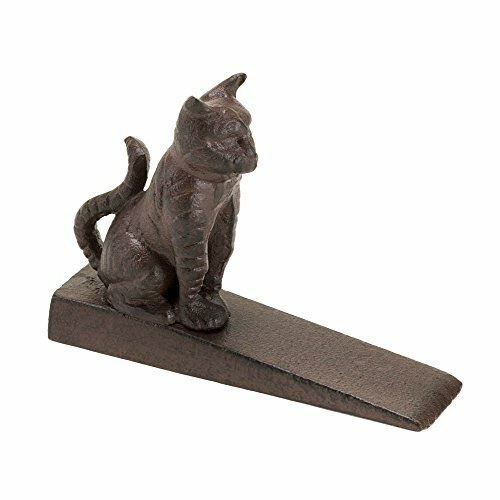 The cat figurine on this metal door stopper wedge features delightful details that will look cute in your home. This decorative cat door stopper bronze color is made of cast iron - great material for a decorative door stopper. Want a floor door stopper that\'s both functional and cute? who needs a dog door stopper when you can order this cute cat door stopper? Cat door stopper weight: 1.2 pounds; funny door stopper security dimensions: 5.75" x 1.5" x 3.5"
If you have any questions about this product by Accent Plus, contact us by completing and submitting the form below. If you are looking for a specif part number, please include it with your message.